Blossom Beanstalk offers a variety of gently used, high quality baby clothing (newborn to 5T) at fantastic prices. We also carry a wide variety of new, baby carriers, herbal products by Herblore and Sweet Herb Medicinals and more! 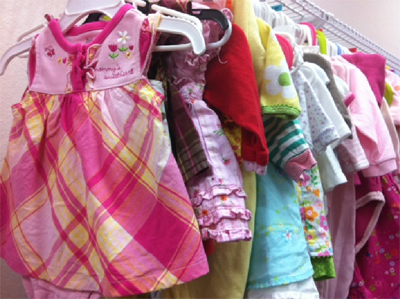 The Blossom Beanstalk is a resale and retail shop benefiting Blossom Birth Services, a nonprofit education center offering resources for new and expectant families. All proceeds from the sales directly benefit the programs and services of Blossom. Donations of new and gently used items are always welcome. Clothing and linen items must be free of stains and holes. Toys and equipment should be clean, complete and have working batteries. A tax-deductible receipt is available if requested. Volunteer Opportunities are available, please inquire! For larger items like changing tables, play yards, bassinets, etc. Please contact the office at 650-321-2326 or blossom@blossombirth.org to make arrangements for drop off. Items that have been recalled. Please reference www.recalls.gov/cpsc.html for recall info.